These Alaska airport map thumbnails show FAA-designated commercial service airports, reliever airports, and general aviation airports in the State of Alaska. Click on each of these thumbnail maps to display detailed regional airport maps. 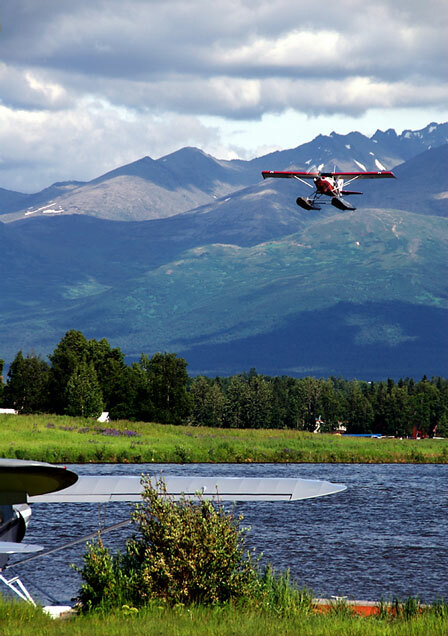 Because the Alaskan terrain is formidable and there are great distances between settlements, the major means of transportation is by air. Bush pilots are used to transport settlers, medical help, and supplies into the interior. Floatplanes abound. Air taxis can be used for traveling to specific destinations. 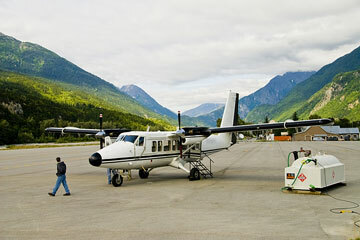 Besides the large number of small airports and private airstrips used to access remote parts of the state that have no highways, major Alaska airports include the Anchorage International Airport, the Fairbanks International Airport, the Juneau International Airport, the Merrill Field in Anchorage, and the Valdez Pioneer Field. The photo at right shows a small airplane on the tarmac at Skagway Airport.